It is with deep regret that we announce that long running musical ‘Blood Brothers’ is set to close in the West End, after a record breaking 24 years. The show, currently running at the Phoenix Theatre in London’s West End, as well as a successful UK tour, has apparently just been ‘breaking even’ and has suffered with the recent downfall of tourists in the West End due to the Olympics. According to online news reports, the reason the show has closed is due to an agreement between theatre producer Bill Kenwright and owner of the venue Ambassadors Theatre Group. The show has been a staple in the West End for so many years, and it is sad that this has suddenly come to an end. Unlike many shows that end, the notice period has been relatively short, with cast and crew given notices last Saturday. People took to Twitter straight away to discuss the closure, and after a weekend of rumours it took until yesterday for the producers to address the situation and make an official announcement. Although it was originally thought that Blood Brothers would replace the now closed production of Dreamboats and Petticoats at the Playhouse Theatre (another BK production) this has not been confirmed. With both Kenwright shows now out of the West End, all eyes are on the theatre producer to see what his next move will be. Blood Brothers joins the ‘bloodbath’ of the West End that has seen many popular shows shut up shop. Chicago, Dreamboats and Petticoats and Ghost are three popular musicals that are all closing at the beginning of this season. With larger musicals such as The Book of Mormon, Viva Forever and The Bodyguard arriving in the West End from November, the face of London Theatre is quickly changing. Rumours have been flying about which show will take over both theatres. It is thought that a successful Broadway production such as ‘Peter and the Starcatcher’ or the Tony Award winning ‘Once’ are looking at the Playhouse and the Phoenix respectively. Saw this show in Glasgow for the first time, it was a wonderful show. The actors were superb. Its a shame its closing. I wish all the cast well and I am sure they will get into other shows. Wish you would bring it back to Scotland again. 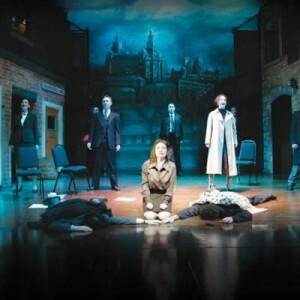 Very sad news about Blood Brothers closing , i have been a fan from the Barbara Dickson days. It is such an amazing show with fabulous musical scores covering every emotion . I have to say my favourite all time Mrs Johnstone is Maureen Nolan , which led me to see the show over 100 times when she was in it . i guess “its just another sign of the times ” Farewell Mrs J , Mrs L , Mickey , Eddie , Our Sammy ,LLLLinda, its been wonderful to know you . I sincerely hope a DVD will be made available – the CD alone is not enough. So sad to hear this! I love this musical, such a shame it’s closing. Watched it during it’s UK tour and my drama group is putting on this production which has made me fall in love with it all over again and to hear it’s curtain will fall for the last time on Oct 27 makes it so sad. Thankfully the UK tour will continue next year and hopefully a lot longer. I am really sorry to hear that Blood Brothers is closing after 24 years. I am a regular theatre goer and to be honest this show did not appeal to me. It was only a few months agao my friend got tickets and we went and we both thoroughly enjoyed it. None of us could believe how we had never been before. In fact I enjoyed it so much that I took my Sister 2 weeks ago and she too really enjoyed it. I would like to say a big thank you to all the cast and crew that have put on a wonderful performance and wish you all the very best for the future. I am really sorry to hear that Blood Brothers is closing after 24 years. I am a regular theatre goer and to be honest this show did not appeal to me. It was only a few months agao my friend got tickets and we went and we both thoroughly enjoyed it. None of us could believe how we had never been before. In fact I enjoyed it so much that I took my Sister 2 weeks ago and she too really enjoyed it.I would like to say a big thank you to all the cast and crew that have put on a wonderful performance and wish you all the very best for the future. Absolutley gutted,was really looking forward to seeing the show in November.Hope the tour continues and that it comes to the Nottingham/Derby area….. soon !! Having had the great fortune and joy of being a member of the cast of Blood Brothers in 1996/7, and working alongside the wonderful team and brilliant cast, who at that time included the sublime Stephanie Lawrence, I am really sad to hear that the show is closing. Blood Brothers is like nothing else in the West End, it is and always will be a simply brilliant piece of theatre, loved by so many for very good reason. I am so proud to have been a part of it’s history. I’m so sorry about the hear that the show is closing. So annoyed that Blood Brothers is closing! Won’t be able to see it again before the curtain falls for the last time which is really making me super sad! I hope they keep the UK tour going for a few years at the very least as all my friends and I are huge fans! So glad we’ve had the pleasure of watching the show before and just hope and pray that one day Blood Brothers shall return to the West End. Thoroughly enjoyed Blood Brothers.I believe a movie is being planned.Pity the show could not have reached its 1/4 century run. Is this theatre politics? I suspect Lord of the Rings early closing was due to Cameron wanting to re-run Oliver. One would think that a theatre owner would be not so arrogant so as to curtail a very expensive show for his own greed or vanity.It appears that Oliver was not the money-spinner it was expected to be. With ticket prices getting obscenely expensive,audiences do not want to be fobbed off with re-runs every now and then. This is a very important show and we feel that it should be given its rightfull place in the capital of London for all the drama students, and schools who intend putting on a production and for the overseas visitors. Boris Johnson should get involved in saving this masterpiece of the British stage that was created by the British! Yes an all British production. We saw this wonderfully production tonight Thurs 27th September 2012. Sad to see such an icon of British Theatre closing. I have booked to see the touring version at Skegness in October having seen the West End version many times over the years. Thank you Willy Russell for giving us a veritable gem!!! Its unbelievable that this amazing show is to close – can’t remember how many times I’ve seen it and insisted that others come along with me. Everyone agrees it was memorable, a true social commentary, and an important one. Always loved all the actors who never needed gimmicky sets or technological aids. It should be established in the way THE MOUSETRAP was. By the way, every time I’ve attended the theatre has been packed…. I saw this at the phoenix theatre and it was fantastic! I recommend all to see it! Made me laugh and cry! A short -mail to say how sad I was to see the performance on Thursday 8th November. Not because there was anything wrong with it – far from it! Just because I have been taking students to see Blood Brothers since it opened – on occasions, three times per week! It has become a large part of my life and the lives of the students here at the school. Many students have taken their parents to see it after they have seen it with the school. It is interesting that it still has so much relevance after 24 years on the stage. For us, we will need to write new units of work to fill the gaping hole Blood Brothers will leave and I can honestly say that I am going to have to work hard to find something as effective and affective as BB. Thank you all for the so many fantastic memories you have given my students. So sad the show has closed! I saw the original production in Liverpool with Barbara Dickson and have seen almost every cast at least once since. Never failed to make me sob at the end! One of the best shows in musical history. Pleeeease bring your show to germany!!! I’ve seen it once and have been dying to see it again but London’s just too far!!! Even if show closes in West End why not keep touring. Come back to Glasgow soon please, please.